whilst Prince didn't say it first, it's his rendition of this traditionally, formal salutation that I'm thinking of as I reflect on last Saturday's fantastic celebration of love, marriage and equality. though the cultural affair of a wedding can be traditional and formal, this beautiful couple's love and occasion to make it official is only now becoming a regular tradition and accepted as formal. as Illinois joins the other 36 states which honor and respect all love equally, we are writing another page of history. Nicole + Allison prepared for their party at the gorgeous Hotel Monaco and headed to Ravenswood for their beautiful Valentine's Day celebration at Chicago's awesome Architectural Artifacts; perfectly arranged, catered & produced by the talented team of Jordan's Food of Distinction. In their thank you address to their friends and family, Allison + Nicole shared their love and appreciation for those who came to bear witness to their love. Allison also noted the giant steps towards equality we've made as a country and how we still have a ways to go. with the respect, kindness and honor towards equality of love + marriage, we use this momentum to carry us forward. Nicole + Allison, thank you both from the bottom of our photographic hearts for inviting us into your celebration, into your worlds and into your monumental journey. 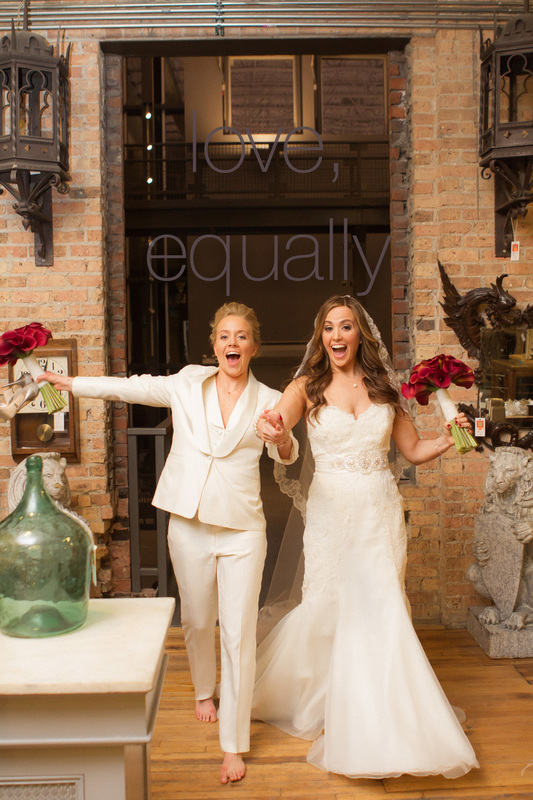 we are honored to have been a part of such a beautiful celebration and are proud to share the love equally.